This is exactly what I had in mind, but of course, this kind of set up is very costly. I’m sure there are people out there that had the luck of knowing a day care or other type of facility that allowed them to get these products cheap (if you are one of these people or know how I can get a deal, let me know! ), but for the average person, this set up is a little expensive. If I had the space to dedicate to an all-out play area and/or were planning on having more children (or had a lot of children in the family to have over, which I don’t), I would make the investment, but between cost and space, I decided to look for other options. After viewing the professional equipment, I couldn’t help but think that for a commercial product, there is usually something else on the market made for the same purpose but at a lower cost for consumers. There has to be other parents out there that love the idea but demand a more affordable product, and this is what I found it be. It had the four main components that I wanted- a tunnel, a wedge….but I ended up having some reservations about this product. The reason I didn’t go this route is mainly because my husband would probably make fun of the fact that’s blow up, that it would probably get popped or that it’s a cheap substandard solution (keep in mind this is not an actual review of the product, but my thought process at the time). 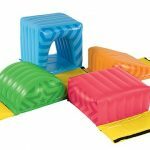 I would normally get over that, but with my son’s room being on the smaller size, I know that his play area would not always be set up and the thought of having to inflate and deflate every time I wanted to play with him made it less desirable. The third disadvantage was the price tag. While $100 is definitely less than the $400 professional counterpart, I can’t see spending that much on what essentially is a blow-up toy. To me, the mark-up seems to be extreme. So, while I really like that there is a product available geared more to regular consumers, I wasn’t sold. -DIY- At the time that I would thinking there has to be a cheaper product available, I began to think of the possibility of creating something myself. After all, the play equipment are essentially only really big shaped cushions. Ok, there’s a little bit more to it, but you get the idea. 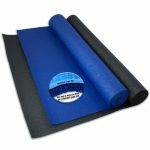 My next step was to find play mats or gym mats or some similar existing product that would serve the purpose of the ‘cushion’, with my job to be to shape it into tunnels and wedges, etc. The closest I got to a play mat that would be cost effective was an extra-thick, extra-wide, extra-long yoga mat(if you know of something better that is closer to the vinyl/padding of the actual professional gear, let me know!). Due to lack of motivation, initiative, or whatever else you want to call it (laziness? being busy?,,,,), my yoga mat idea had potential, but alas, did not pan out. The main obstacle that I failed to overcome was creating the rigid structure for the shapes. Once a solution could be solved for that, it would be very easy, at least in theory, to cover the structure inside and out with the form to create a suitable surface for him to play on. Making this selection wasn’t an absolute slam-dunk. I did have concerns as to whether or not it would be study and stable enough for my son to climb on. After using the blocks, they are extremely sturdy when at least four blocks are interlocked. I would have no problem standing, myself, on a four-sided block, but when trying to make constructions that are 3-sided, you have to be careful. Having a block structure without much option to use diagonals or other shapes can be restriction, but I guess that’s half the challenge.I had not been looking for this product specifically—it was one of the many I found during my internet search, but one of the few products of my search that actually met my criteria. I did not have waffle blocks as a child so I wasn’t familiar with them, and at first I was wary of it making the cut, but the more I thought about them, the more I liked them, and this is the ‘toy’ that I ended up going with. For particular structures, it is very easy to zip tie corners, or other load baring areas, together. 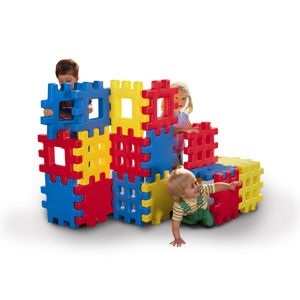 This is certainly not a requirement to enjoy or make use of the blocks, but zip ties are extremely handy to add a little more support, especially if your child is climbing on it, to keep the blocks together if you need to move it, or to attach them to something else for functionality (see waffle block page). Also, at the time I bought it, it came out to be $90 for the basic 18 block package, which, when I think that each block is $5, seems pretty pricey. But, my budget at the time was $100 and it was getting close to Christmas, so I decided to go with it. Plus, if you compare 18 pieces with the 4 pieces in the inflatable package, it doesn’t seem so bad. Since then, I’ve been checking ebay and other similar sites to try to find better deals—it’s definitely possible to find, but it’s all about the timing. What I liked immediately about the blocks is that they are not one, or two or three, large piece, which makes storage much easier. It certainly takes a lot more space to store these blocks versus deflated vinyl, especially when you have multiple sets, but they can easily fit under the bed, and being flat makes it also easier. to see where he is when getting in and out of the room (he otherwise likes to sit right in front of the door), and when he’s playing alone, I can keep watch from the hallway or check in every now in then without disrupting him. The counter to that is that he can see out of the room and he since he’s in the attention-loving stage, he sometimes stands in front of the baby gate holding on to and shaking the bars like those to a jail cell. I open the gate and build a structure immediately outside of it. The waffle blocks work to still keep him in one closed-off area, but give him the feeling of stepping outside the room. Not only does it work to keep him from crying, but further entertains him by giving him something new to see or play with. I can acknowledge that the waffle blocks are not the perfect solution to my original request as the block structure makes it a little cumbersome to make the wedge and tunnel that are easily created by the inflated toys and the ideal professional set-up. But they do meet the requirement well enough with also giving the added bonus of being able to create many more structures and in addition, serving other purposes. the waffle blocks, I’m constantly thinking of all the other things I could make if only I had another set of blocks. I am very excited to, in the future, have dozens of more blocks and making all sort of intricate structures. And if I’m that interested in the blocks, I can only imagine much my son will grow to like them. I am always looking for other ways to improve my existing play area and encourage other parents to share with me their own set ups. On the ‘Waffle Block” page I have been keeping track of all the structures and uses that I have found for the blocks, as I hadn’t found a good source for this when I had been researching my purchase before.